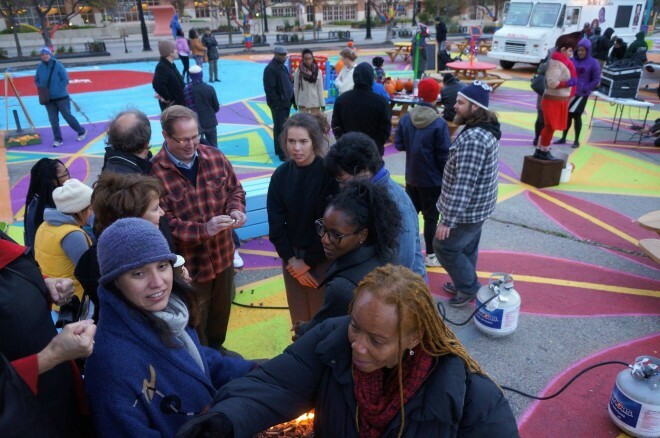 On a brisk autumn evening in late October, the city of Milwaukee celebrated its newest, most unexpected, and most unconventional public space with a community Harvest extravaganza. 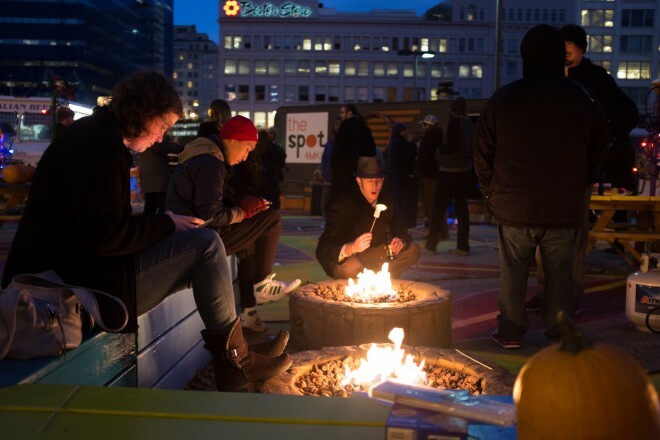 Dozens of residents gathered at The Spot 4MKE, where they carved pumpkins and roasted marshmallows around fire pits, danced while belting out favorite karaoke tunes, and enjoyed live performances and delicious food prepared by local vendors. 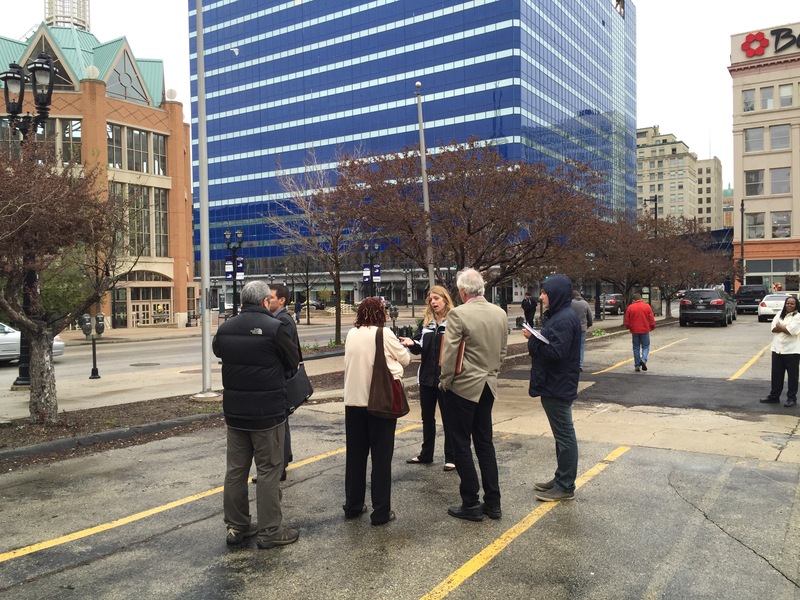 In early 2014, the Wisconsin Ave. Milwaukee Development Corp (WAMDC) selected Creative Alliance Milwaukee (CAM) to lead a multidisciplinary team in a process to identify the best uses for the site. This creative problem-solving process included a rich and varied public engagement component, along with a careful study of the spatial characteristics of downtown and an analysis of the site’s potential. 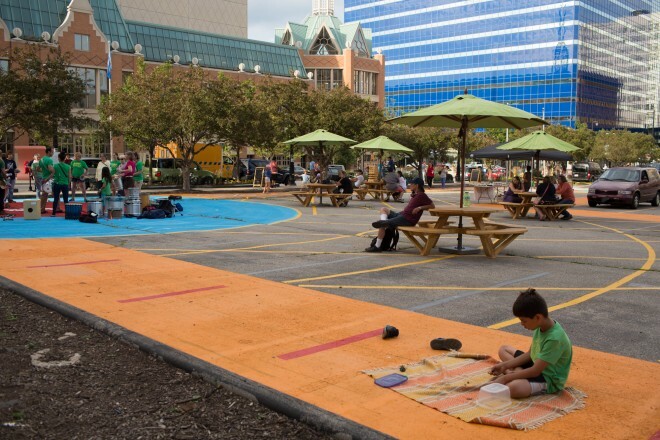 The process included more than eight months of research and observation, including intercept surveys and public art input mechanisms at the 2014 once-a-month summer Night Market (produced by the Greater Milwaukee Committee and NEWaukee and funded by a grant from ArtPlace America). The team discovered that there was huge demand for more dynamic, inclusive, and community-oriented activity downtown and that any development of the site should include a flexible public space that supports a wide variety of activities as a key component. Based on these observations and public input, the team recognized that even in one of the nation’s most segregated cities, it would still be possible to create shared places and a community atmosphere that all Milwaukeeans could enjoy and be a part of. On April 22nd, Milwaukee was announced as one of the six 2015 Southwest Airlines Heart of the Community cities. 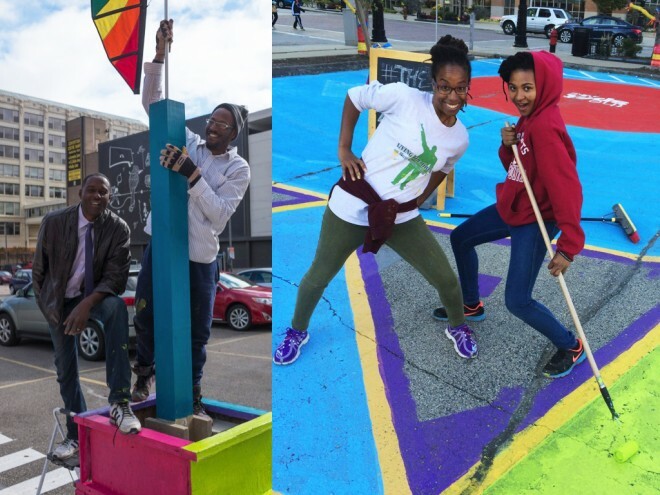 Over the next six months, the local project team and PPS used “Lighter, Quicker, Cheaper” (LQC) Placemaking principles to ensure that the The Spot 4MKE continued to be a collaborative, inclusive, and community-led project. “The entire team felt very strongly that we shouldn’t do too much too soon…that we should allow the project to grow in stages throughout the summer and fall, with plenty of room to learn from what we were seeing and to feed that knowledge back into the shared vision for the place” said PPS Senior Associate Philip Winn. This iterative approach began with a public workshop in early May, where community members helped develop a shared vision for the space and identify the best “first move” for the project. The next month, the team began deploying a few simple elements to delineate the project site (an L-shaped portion of the entire lot). The goal was to clearly communicate to users and passersby that this area was now a place for people, not cars. Team member Chris Socha of The Kubala Washatko Architects created a colorful site graphic (labor and materials were donated by local contractor Crowley Construction), and an initial suite of amenities including picnic tables, umbrellas, and games began to arrive on site. This basic infrastructure helped support a diverse range of programming over the first months of the project, from samba drum and dance rehearsals to storytelling events and performances by a local hula hooping group. The site was also home to a small mural project crafted by project partner True Skool. As Fall approached, the team was ready to bring several more layers of physical changes, amenities, and regular programming to the site. Contractor VJS Services donated a construction trailer that was transformed by local architect Mark Mishefski and team into a colorful storage space and home base for on-site staff, complete with exterior hula-hoop racks and signage. Additional amenities like beanbag chairs, giant games, and a sound system were also added to the mix. During this time, CAM also launched their inaugural artist in residency program with Mikal Floyd-Pruitt and Fonde Bridges aka Concrete Dreamers. 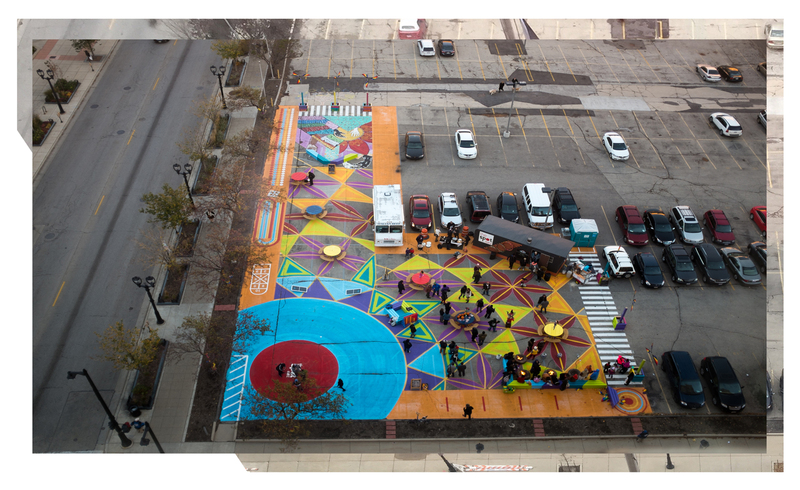 Concrete Dreamers worked with artist Tia Chianti Richardson to devise a ground mural that integrated with Socha’s existing pattern and allowed for community members to participate in painting large portions of the design. The resident artists produced six weeks of creative programming on the site, including everything from small performances and karaoke to free chair massages and daytime dance parties. The big news of the day was Jacobus’ announcement of a $50,000 challenge grant from the Herzfeld Foundation. If they can raise a matching $50,000 from other funders, CAM plans to put the entire $100,000 towards future programming, management, and physical improvements for The Spot 4MKE. “This is exactly the kind of catalytic effect we hope to jumpstart with our Heart of the Community grants” said Hoagland. Viewed from the 5th floor of the historic downtown Hilton, the transformation of the past six months comes into sharp focus. 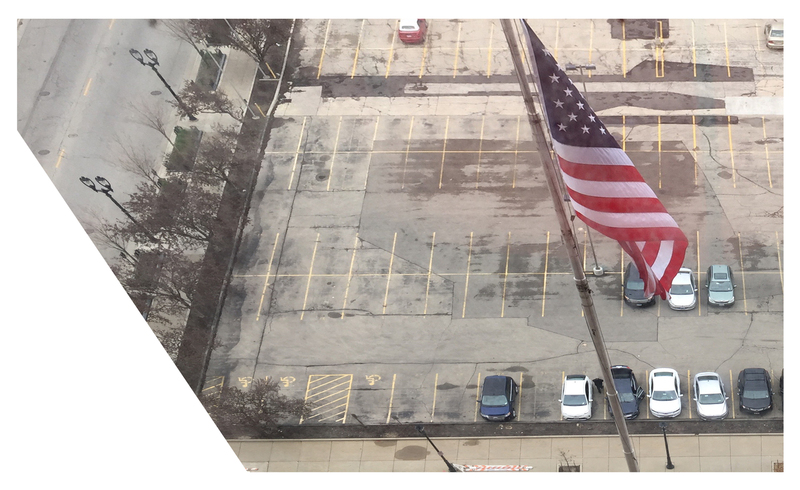 Since The Spot 4MKE currently occupies a small portion of the existing parking lots, the "before and after" condition of the place is self evident. Walk through the lobby and out onto the site and the contrast becomes even stronger. The Spot 4MKE is still a humble place, but it is full of evidence of a community that is trying to do things differently, a community that has the courage to lead with people and places, a community that understands that the project of making a more creative, inclusive, and prosperous city will never be finished.